When he arrived in 1867, Alonzo Erastus Horton was not the first to be attracted by San Diego's natural beauty, but as the historical father of contemporary San Diego, he was certainly the most influential. Horton bought and sold or developed most of the land that is now downtown San Diego. Named after his namesake Horton Plaza Park, which houses the Horton Park Fountain and is near the bronze statue of the man himself, this neighborhood is where the redefining of Downtown began. The Horton Plaza Redevelopment Project was adopted in 1972 to spearhead the transformation of downtown from the center out. The first development was the six and one-half-block Horton Plaza retail/entertainment center, which ingenuously houses over 140 shops and restaurants in a colorful labyrinth connecting seven open-air split levels. In 2019, the shopping mall known as Horton Plaza was closed and plans are being approved to turn this space into The Campus at Horton, which will be mostly offices with some retail and entertainment venues, estimated to house about 4,000 jobs. 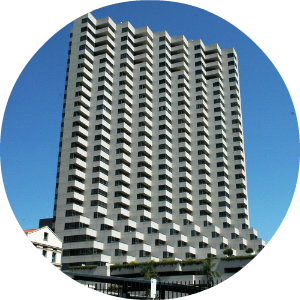 Today, the Horton Plaza neighborhood includes a Westin Hotel, the Meridian condominium tower, Horton Fourth Avenue apartments, the SBC and NBC office towers, Spreckels and Balboa theaters, and the Federal Courthouse & Office building. Residential opportunities may be limited, but this 15-block district puts residents at the center of Downtown's activity. The area includes luxury condominiums and apartments amidst high-rise office buildings, retail, hotels, theaters and restaurants.